This week I am delighted to be the guest on my friend Jan Baynham's blog. 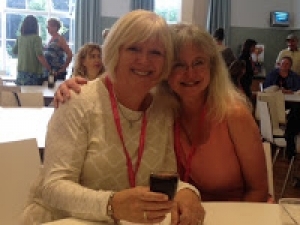 Jan and I have been online friends for some time and we met in the real world for th first time last summer at the RNA Conference in Lancaster. This photo is of us at this summer's RNA Conference in Shropshire. Jan's blog is always of interest to writers, being a mixture of interviews with writers and posts about her own experiences as a writer and a reader. - which came first, the plot or the characters? - how much editing did I have to do on The Deserter's Daughter? - do I have a writing routine? Oh yes, and I also share some sneak preview information about my next book. Here's the link: Jan Baynham's blog I hope to see you there! Thank you for coming into the blog, Sue. Already there are lots of comments from people saying how much they enjoyed finding out about your journey to publication. Although I don't like having my photo taken, I do like this photo of the two of us, too, Louise. It was great to see Sue in person again at this year's conference. I hope you enjoyed reading the interview. That's exactly why I wanted to put it here, Louise, and Jan has used it on the blog post as well. I'm not the world's most photogenic person, but I do think this is a lovely picture of both of us. I hope you enjoy reading the interview. Jan asked some interesting questions. I will follow the link to Jan Baynham's blog, but I just wanted to say here what a lovely photo it is of the two of you. It shows you really are friends.